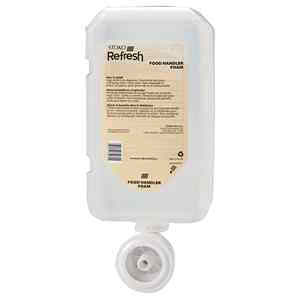 Catalog: Refresh® Food Handler's Foam Cleanser 1000 mL. 4/Case. Refresh® Food Handler's Foam Cleanser 1000 mL. 4/Case. Formulated for the special needs of food processing and handling, this foam is a cleanser and antimicrobial agent in one that kills 99.99% of foodborne germs that can cause cross contamination—including E. coli. It's also fragrance-free and dye-free. NSF registered. 1000 mL. 4/Case.